An L/S model 26 with shoulder strap and a stack of extra 20-round magazines. Picture from the factory brochure. This is my second version of the Lahti/Saloranta model 26 LMG, the third in my series of Finnish weapons. If anyone has additions or comments, please let me know. -:The L/S Machine Rifle Model 26/32. Valtion Kivääritehdas, Jyväskylä 1933. -:L/S-pk:n lipaspussien ja laukkujen käyttö. Jalkaväen tarkastajan toimisto. Helsinki 1936. The Lahti/Saloranta model 26 is an automatic rifle / light machine gun in the same class as the Browning BAR. The weapon had a rifle stock with a pistol grip, a curved, underslung magazine, a perforated barrel jacket and an integrated bipod. It was designed by the famous Aimo Lahti and Lieutenant A.E. Saloranta and was capable of both semi-automatic and full automatic fire. The practical range of the weapon was 200 to 400 meters. Both 20 box and 75 round drum magazines were produced but the Finnish Army seems only to have used the smaller capacity magazine. The 1940 Handbook of the Officer of the Reserve claims that the drums would only be issued for anti-aircraft and defensive fire missions. I have not run into any wartime photographs showing the drums actually being used. For obvious reasons the practice of firing short, three to five round bursts was recommended. Accessories were issued along with the rifle. These included a spare barrel carried in a round tube and a holster full of maintenance tools (tongs, pliers, oil can, screw driver, mandrels etc.) and small spare parts (locking bolts, springs, axels, and so on). According to a factory brochure the barrel could be changed in seven or eight seconds (15 CA) but a book for officers of the Reserve talks about 25 to 30 seconds (55 CA). Apparently the bolt had to come out at the same time as the barrel, which was impractical in the field. Gunner and assistant. The round tube contains a spare barrel. The rectangular bag is the magazine pouch. Picture from the factory brochure. Specially designed bags and leather pouches were provided for the purpose of transporting magazines for the gun. The bags were of cloth and could be fastened onto the soldier's carrying belt or load bearing harness. The pouches were of cloth and hard leather and designed to be slung over one's shoulder. Each bag or pouch held five loaded magazines and an LMG was allotted a daily ration of 1200 rounds. The gunner carried one pouch, his assistant two pouches. Every ammunition bearer carried two bags which were to be held in the company's ammunition vehicle until needed. The rest of the ammunition was to be kept in the ammunition vehicle (which was usually a horse-drawn cart) along with the two 75-round drum magazines which were only to be used for anti-aircraft work. When the gunner and assistant ran out of ammunition the ammunition bearers were to keep them supplied. It was permissible to throw the magazine bags if the surface was soft but it was recommended that the crew draw the bags back and forth using a thin rope as this would keep activity around the gun to a minimum. A magazine filling apparatus was also provided. This would be fastened onto a tree and a magazine inserted. 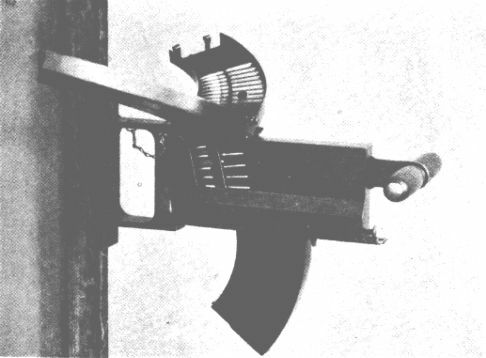 Bullets were then funneled into the magazine and rammed into place, improving the magazine loading time (use 2 CA per bullet when using the apparatus). The L/S 26 magazine filling apparatus. Picture from the factory brochure. The L/S 26 won a 1925 Finnish Army competition and was selected as the Army's automatic rifle. More than 5000 were built between 1927 and 1942, when production was stopped. The only international sale was a huge order of 30 000 units in 7.92mm caliber to China in 1937. Only 1200 of these weapons were actually delivered. Tactically, during the Winter War the automatic rifle formed the nucleus of an automatic rifle squad which was composed of a squad leader, the automatic rifle gunner, his assistant and four ammunition bearers. The automatic rifle gunner would be armed with a pistol in addition to his main weapon. The rest of the men carried rifles and one of them might have a sniper rifle. There were two such squads in a platoon to provide covering fire for two ten-man rifle squads. Firing the L/S 26. The assistant has taken a loaded magazine from the magazine pouch and is ready to help reload the weapon. Picture from the factory brochure. In field conditions the Lahti/Saloranta model 26 was found to be heavy, lacking in magazine capacity and unreliable. In extreme temperatures and when exposed to dirt the gun's finely crafted mechanism - designed for great accuracy - tended to become clogged. An army study later found out that this was partly due to a lack of clear instructions on how to remove factory grease from the weapon. In addition, the weapon was particularly finicky about the type of 7.62mm rounds it was fed, requiring cartridges with powerful firing caps in order to work reliably. By the time new instructions had been issued, however, the gun had already gained the distrust of men at the front. They often preferred the Soviet Degtjarev DP machine gun, a crude weapon which functioned flawlessly in all conditions. Thousands of DP LMGs were captured, some 1500 in the Winter War alone, and quickly put into service against their former owners. As a result, by summer 1944 only some 3400 L/S rifles were at the front, compared to over 9000 war-booty DP machine guns. After the war about 3000 L/S model 26 rifles were mothballed but some saw service as training weapons until 1985. The remaining examples were apparently scrapped in the early 1990s. Thousands of Degtjarev DP machine guns are probably still in Army storage depots.